If you give kids a language, they can use it. I think that’s what these educators fear. If you really educate these kids, they aren’t going to punch you in the face, they are going to challenge you with your own language. MEGHAN: Good morning Ags. 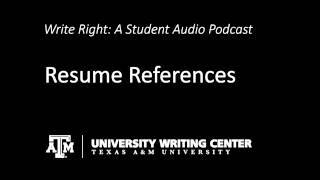 I’m your host Meghan Wall and welcome to “Write Right.” Ever wonder how to get the references you need for a job application? Well listen up because here’s a quick tip on how to do it. CINDY: And what about those references; what if the application said that I needed references? MANDY: In that case include them on a separate sheet at the interview. Use no more than three to five references, including at least one academic and one work-related reference. Don’t use family members, friends, or clergy. Include the individual’s name, job title, company name, address, email, and phone number.Always ask permission to use people as references, and give them a copy of your resume and cover letter. This will help them know what your goals are and not restate information that is already on your resume. Right now is the time to be building those references that means that you should make a good impression on current employers and professors so that they will give you a good reference one day.